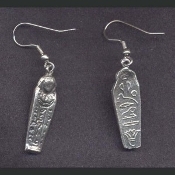 Funky MUMMY COFFIN EARRINGS - VINTAGE Sarcophagus Egyptian Tomb Egypt Novelty Charm Jewelry - Pewter Metal Alloy DOUBLE-SIDED Charms, as pictured. Approx. 1.25-inch (3.13cm) high x 1/2-inch (1.25cm) wide. A very unique gift for Indiana Jones fans, History Teachers, Museum Aficianados, Antiquities Collectors, budding Archeologists, Anthropologists and wanna-be Egyptologists.